You all know by now just how much I love a good slogan tee/jumper/sweatshirt so it will come as no surprise that this New Look knit made its way in to my collection this weekend! 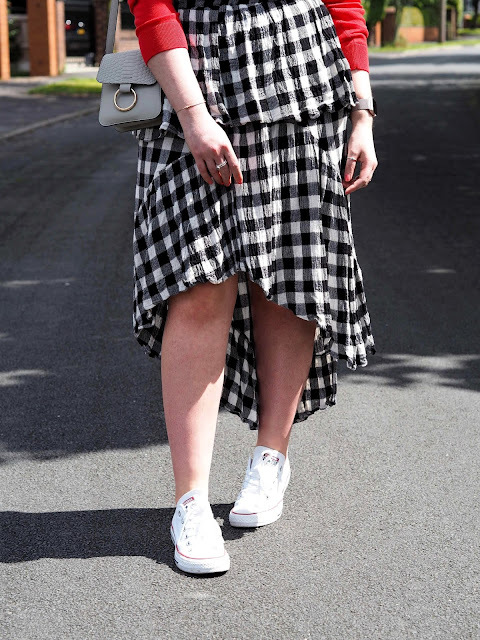 As soon as I saw it in store I knew exactly what I wanted to wear it with – the Asos gingham skirt of dreams, of course! 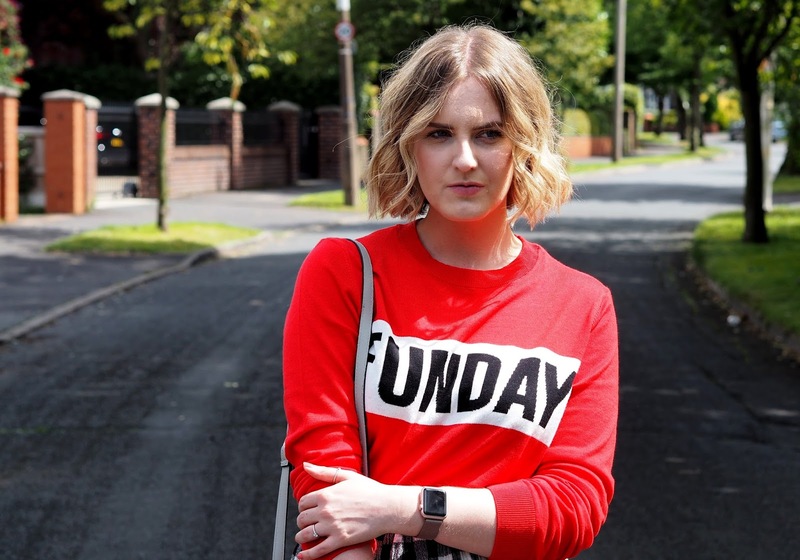 I love wearing red and monochrome together, so this was the perfect pairing, and we just so happened to have a sunny few hours this morning to shoot this look! 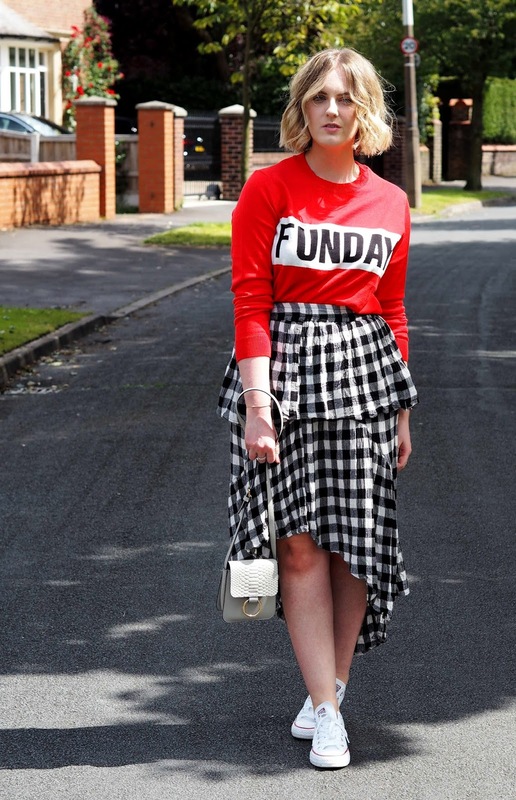 This skirt has made a fair few appearances on my blog now, such as when I wore it to see Blossoms live in Liverpool, and in this outfit earlier this year with (shocker) another slogan tee! As much as I love both of those looks though, this has to be my favourite so far as it just lends itself so well to bright colours, which is great because when I bought it I wasn’t entirely sure what I could pair it with. Turns out it goes with pretty much my entire wardrobe!! 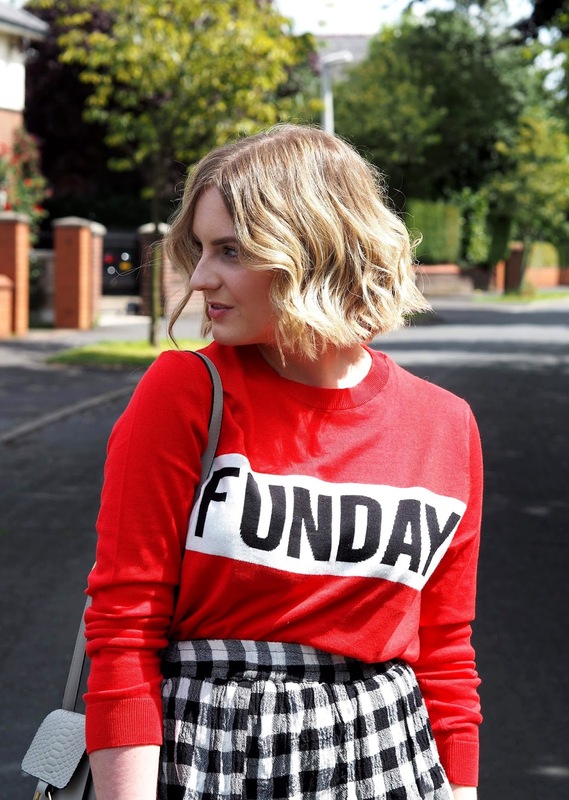 Midi skirts, comfy jumpers or T shirts and Converse is quickly becoming my weekend uniform in this unpredictable weather, so much so that I’ve got my eyes on a couple more midis to add to my collection! This striped wrap skirt would look so good with a white cropped tee and trainers, and this gorgeous yellow pleated midi skirt in velvet (looks better than it sounds, promise) is dreamy! Get in my wardrobe! On a side note, I’m super annoyed with how Blogger has drained colour from these photos, which looked SO much brighter before they were uploaded. They really don’t do the outfit any justice and I’ve noticed it happening a lot with my images, so if anyone knows how to stop this from happening please do let me know!! Hope you’ve all had a fabulous weekend. How have you spent yours?